Illegal migrants from Africa walk in line at a naval base in Tripoli after being rescued by Libyan coastguard in the Mediterranean Sea off the Libyan coast in August 2017. 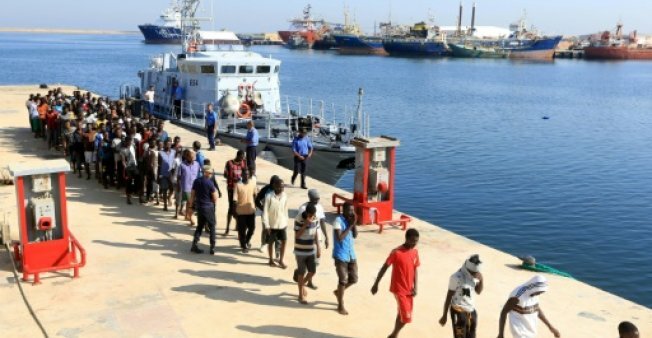 TRIPOLI - The Libyan coastguard has rescued more than 3,000 migrants in 12 separate operations off the country's west coast in the past week, the navy said Sunday. Most of the rescue operations were staged off the cities of Zawiya and Sabratha, navy spokesman General Ayoub Kacem said in a statement. It was the highest such tally reported for a one-week period since mid-July saw a dramatic fall in migrant numbers attempting the Mediterranean crossing to Europe. Italy, the closest and main destination, has recorded 6,500 arrivals since then, barely 15 percent of the figure for the same period in the past three years. Earlier in July, Italian Interior Minister Marco Minniti proposed a pact to combat human trafficking during a visit to Tripoli to meet mayors of cities affected by the scourge. Six years since a revolution and NATO intervention that toppled dictator Moamer Kadhafi, violence-wracked Libya has become a key gateway for clandestine migration to Europe. The Libyan coastguard has rescued more than 3,000 migrants in 12 separate operations off the country's west coast in the past week, the navy said Sunday. Most of the rescue operations were staged off the cities of Zawiya and Sabratha, navy spokesman General Ayoub Kacem said in a statement.